Made from Carbon Steel. Duly Hardened & Tempered. Paratech's crew tools include a full line of Hooligan (halligan type) Tools in four different sizes and three different types (standard, hazmat and single piece forging). The PRT (Percussive Rescue Tool) is one of the safest and versitile crew tools available for forcible entry. Paratech's TopCut Fire Axe virtually reinvents the axe with its TopCut design and halligan bar mating feature. 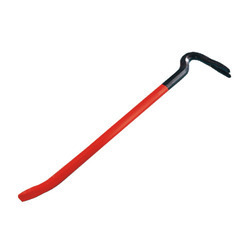 In our range of forged tools we produce Striking Tools or Hammers. The hammers produced by us are Claw Hammer, Sledge Hammer, Machinist Hammer, Ball Pein Hammer, Club Hammer, Cross Pein Hammer & Stonning Hammer. This range of tools is used by Industrial and DIY segments. In this way, this range comes under the category of Industrial Tools & DIY Tools. Our company offers a wide range of striking tools that are in compliance with the DIN standards. These tools are fabricated from hardened chrome vanadium steel that provides good resiliency and resistance for hard working stress. We offer these tools at most competitive prices. We are one of the leading manufacturers & exporters of Utility Wrecking Bars.